I hate clichéd perceptions. Simply reading promo material for Melody’s Echo Chamber before hearing a single note, I could already tell what the group’s self-titled debut was going to sound like. OK, so French pop gal Melody Prochet teams up with Tame Impala’s Kevin Parker. Let me guess: echoey dream pop with a psychedelic feel? Delicate, breezy female vocals? Yep, that’s exactly what it sounds like. So if your stomach is already too full of dream pop with delicate female vocals, you might be forgiven for approaching this with suspicion. Fortunately it’s not as simple as that, since that delicacy is balanced by a rough and fuzzy psychedelic underpinning that lends these songs a vintage quality. At times you’d think they were recorded in the late ’60s. Of course there are some problems with sameyness and the overall sense that, by and large, this has been done before, but it doesn’t prevent the gems from sticking out. “I Follow You” and “You Won’t Be Missing That Part of Me” are the two big highlights here, but the album offers plenty of surprises apart from just psychedelic pop, like the fuzz bass and clipped drum machines of “Crystallized,” or the descent in synth abstraction in the second half. 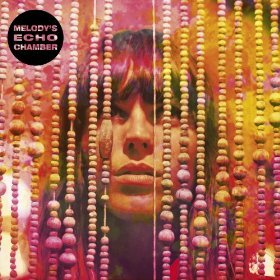 It’s understandable if the “retro” tag makes you nervous, and it does remain to be seen how long the shelf life will be of Melody’s Echo Chamber, but at least as a flash of glory, it works.